WEST POINT, N.Y. — Army coach Jeff Monken breathed a sigh of relief after the Black Knights finished their second straight unbeaten season at home. Now, he has three weeks to prepare for archrival Navy. 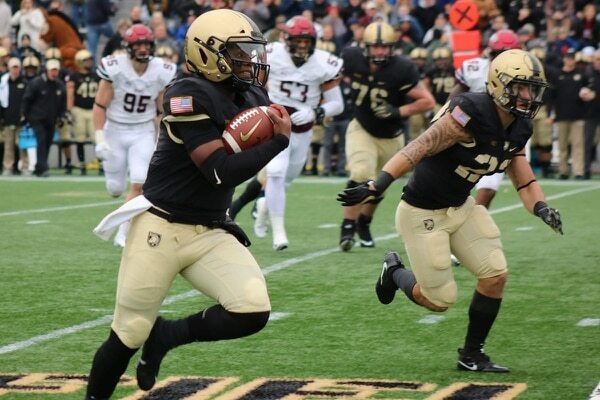 Fullback Darnell Woolfolk rushed for three touchdowns, the 10th time in his career with multiple scores, and Kelvin Hopkins Jr. ran for another score as Army held off Championship Subdivision foe Colgate 28-14 on Saturday to snap the Raiders' 14-game winning streak. "I think it's really important to win at home," Monken said. "When we play here, we're going to be hard to beat. Credit to our guys. They have a good defense. They held us down. We didn't run as effectively as we normally do and we certainly didn't stop the run as well as we have this year." This one wasn't so easy against the sixth-ranked Raiders, who had dominated in winning their first nine games with a stalwart, gang-tackling defense that had allowed only 29 points in nine games. 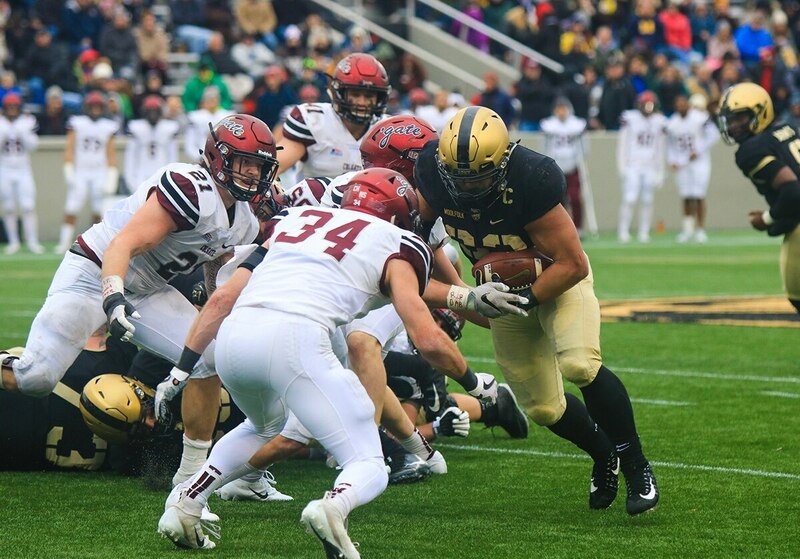 That defense limited the second-ranked rushing team in the nation to 261 yards rushing, 46 below its average, as Army only outgained Colgate 286-251. Raiders tailback James Holland was a big part of that, rushing for 166 yards and averaging 9.2 yards per carry against the ninth-best run defense in the Bowl Subdivision. Army was allowing just under 100 yards a game. Holland's 10-yard TD run in the fourth quarter narrowed Army's lead to 21-14. "That's a good football team," Monken said. "I told our team it was going to be a battle. They made us earn every yard." Army's triple option never gave the Raiders the chance to tie, keeping the ball for over 7 minutes. Woolfolk secured the victory with a 3-yard score with 2:06 left, his 37th career TD rushing to tie Mike Mayweather for third all-time at West Point. "Our kids kept fighting," Colgate coach Dan Hunt said. "They weren't playing, 'Oh, let's just hope they kill it at 21-14 so the score looks good. They were trying to get a stop and get the ball back. Army made a play when they had to. Hats off to them. "We just couldn't get the stop. That's what they do." The Raiders had not allowed a point in the first quarter all season. That changed the first time the Black Knights got the ball. "We talked about it all week. If we got out ahead, we've got to try to put it away," Woolfolk said. "They've got a great defense. They fought back." The Black Knights forced another punt and drove 76 yards in 16 plays to score again. Hopkins kept the drive going with a fourth-down conversion, Army's 30th in 33 tries, and Kell Walker's 10-yard gain off a pitch left set up Woolfolk's first touchdown. Unfazed by the step up on competition and playing with a senior quarterback making just his second career start, Colgate proved a stubborn foe. Raiders safety Alec Wisniewski slammed Hopkins on a run right, forcing a fumble that was scooped up by Tyler Castillo and returned 35 yards for a touchdown to cut Army's lead to 14-7 with 5:52 left in the third. It was the first lost fumble by the Army offense since the season opener at Duke. Colgate: The Raiders excelled in a down year for the Patriot League. The other six teams behind Colgate were a combined 16-44 before Saturday and ranked at the bottom of the national statistics offensively. Still, the Raiders acquitted themselves well against Army and Holland is a real force in the backfield. He boosted his season total to 1,065 yards rushing with 12 TDs and likely will be an important factor in the NCAA playoffs. Colgate held its own statistically in the first half despite trailing 14-0 at the break as Army outgained the Raiders just 138-128 and was helped by two big penalties. In the first quarter, a third-down reception by Owen Buscaglia gave the Raiders a first down at the Army 40, but it was nullified by a pass interference penalty, and later a 58-yard catch-and-run by Thomas Ives off a flanker screen was wiped out by a holding call. Army honored 25 seniors in pregame ceremonies, including the late Brandon Jackson, who was killed in a single-car crash after a big home victory two years ago. Jackson's mother, Morna Davis, was on the field to represent him. Army has three weeks off until it meets archrival Navy in Philadelphia.